Content is the lifeblood of social media marketing. If you don’t have anything worth sharing, you’ll never be able to build an audience, earn traffic or maximize your social media ROI. One of the best places to create content to share is your blog. However, it’s not as simple as jotting down a few hundred words, hitting publish and waiting for the traffic and shares to roll in. Not every blog post will resonate on social media. But not to worry. The first step to writing a blog post that gets shared on social media is to find out what your audience actually wants to read. When you’re writing content to attract search engine traffic, your topic selection is often based on keywords. You use a keyword research tool to find out what keywords people search, then create content targeting those specific phrases. You can use BuzzSumo to search for the most highly shared content based on a keyword or specific website. You can even sort the results by network. This is helpful because content that resonates on Pinterest might not work as well on Facebook. You have to know which types of blog posts to create for each network. Q&A networks like Quora, social media groups and forums are hotbeds of questions waiting to be blogged about. On Quora, start by entering in a broad topic. Then you’ll see a list of suggested searches. Pick a topic closely related to what your industry is about. Then, you’ll see a list of questions people ask. The cool thing about Quora is it has an up-vote system for answers. That means people can vote up answers that they feel are the strongest or most relevant. Look for questions that have answers with a lot of up-votes, because that’s a sign the subject is popular. Groups on Facebook and LinkedIn, as well as forums on your industry, are also home to people who have questions about the topics that you would want to blog about. Therefore, it’s good to use these sources as inspiration for your next blog post. Best of all, if you are timely, you can come back to these questions and answer them with a blog post link. Do your current and potential customers ask your sales and support team questions? If so, have those teams note the questions that are frequently asked. 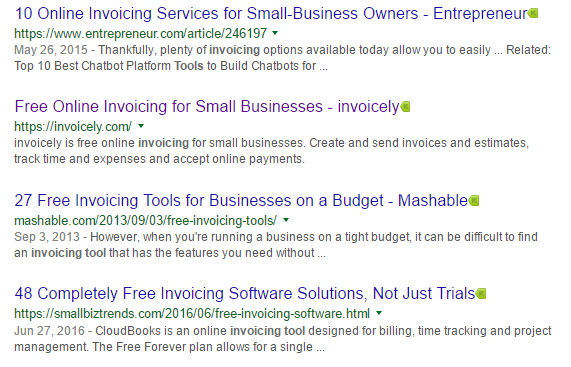 These can make for great blog post topics that will ultimately save time for both your customers and employees. Remember that 61% of consumers research products and services online before making a purchasing decision. Help them get easy answers through your content and save the phone calls for closing sales. Between these three tactics, you should have plenty of good ideas floating around for blog posts. Best of all, these are topics that your audience has shown they’re interested in and are willing to share on social media. And just one last note, list articles tend to work exceptionally well on social media. To give you an example, we analyzed the most socially shared articles related to “social media marketing.” List posts are the clear winner for the most average shares. Now we can move onto the next step. It doesn’t matter if you’re writing an article for a newspaper, magazine or in this case, a blog. Your headline needs to be extremely engaging and compelling. Otherwise you’re going to lose potential readers right out the gate. Think of the articles you click when you scroll through Facebook, Twitter or LinkedIn. More than likely, something in the headline caught your attention and made you click. Your readers need to do the same thing when they see one of your articles in their feed. The text you write inside your Tweet or Facebook post is one thing. But social networks will also pull in meta data from your posts, along with a summary card. In this Facebook post from Greatist, the headline “8 Everyday Activities That Totally Count as Exercise” is being pulled directly from the article on their site. Notice how much the headline stands out nearly as much as the featured image. Needless to say, you shouldn’t treat your headline as an afterthought. Unfortunately, that’s exactly what ends up happening and the result is blog posts with little to no social engagement at all. Be useful to the reader. Mention a unique benefit the reader will get from the article. Ultra specific to the intended audience. Here’s a quick test to show the effectiveness of these tips. If you saw these articles, which headline would you be more likely to click? While the first one is simple and straight to the point, the second one is intriguing, pokes at your curiosity and pulls you in to want to read the article. Just be careful not to clickbait readers. (2) if the headline exaggerates the article to create misleading expectations for the reader. For example, we’re sure you’ve seen headlines such as “You Won’t Believe What This Actor Did After Losing His Oscar!” Headlines like this withhold information about what the article is actually about and force people to click through. What generally ends up happening is readers click your headline, then exit back to Facebook after they’ve been disappointed in what they see. Facebook works that “bounce” into its algorithm. If that keeps happening with your site, your content could start getting buried at the bottom of users’ news feeds. Follow the tips above and you’ll be able to create headlines that readers want to click without being deceptive and clickbaiting. You’ve got your topic picked out and you have a captivating title. The next step is to write the blog post. But before you dive in and start typing away, you need to lay some groundwork. The best bloggers do plenty of research before forming a single sentence. Start by running a BuzzSumo search again. This time, instead of just looking at the share numbers, we’re going to look at the actual articles getting all the shares. We want to know what they’ve done that compelled so many people to share it. After you run a search, you can click on any of the articles to visit the site. How many words is it? If people are sharing longer articles, your 500 words probably won’t cut it. How in depth is it? Similar to the first question, if the content goes extremely in depth and covers every aspect of the topic, a broad high level article won’t stand out. What type of media is in it? Is the article mostly text? Or are there a lot of graphics, videos and other media in the post as well? When was it published? If the articles with the most social shares are old and out of date, you could score a quick win by publishing something new and fresh. In addition to looking at articles with the most social shares, you can also look at content currently ranking on the first page of Google. While search engine rankings don’t necessarily correlate to a post being successful on social media, the content is showing up for a reason. Google sees some value in it. If you can create a post that attracts social shares and also ranks on Google, you won’t need to rely too much on a single source of traffic. Pay attention to articles that appear on both your BuzzSumo and Google search. These are good articles to draw inspiration from since they’ve shown they’re favored by search engines and social media users. In-depth information. It doesn’t have to be longer than your competitor’s blog posts, but it should be more comprehensive. Images and media. If possible, include more screenshots or photographs detailing the process. It’s not possible with all subjects, but it is possible with many. You can really step things up by including custom graphics or even videos. Data and stats. Content needs a certain trust factor and social proof to be popular on social media. Boost your trust factor with more statistics, case studies and other data so readers know that it is well-researched content. People love to share stats. With those things in mind, you can start writing your blog post in a couple of ways. Note: You will add in supplementary content (images, data, etc.) and optimize your content later. Right now, the focus should be on getting the blog post content drafted. Also, everyone has different writing styles and habits. Find what works best for you, but you can use this as a starting point. For some writers, starting with an outline will help you ensure that you cover everything you want to cover in an organized manner. You can start with specific headings you intend to use throughout your post or simply block the main points that will be expanded upon throughout your content. 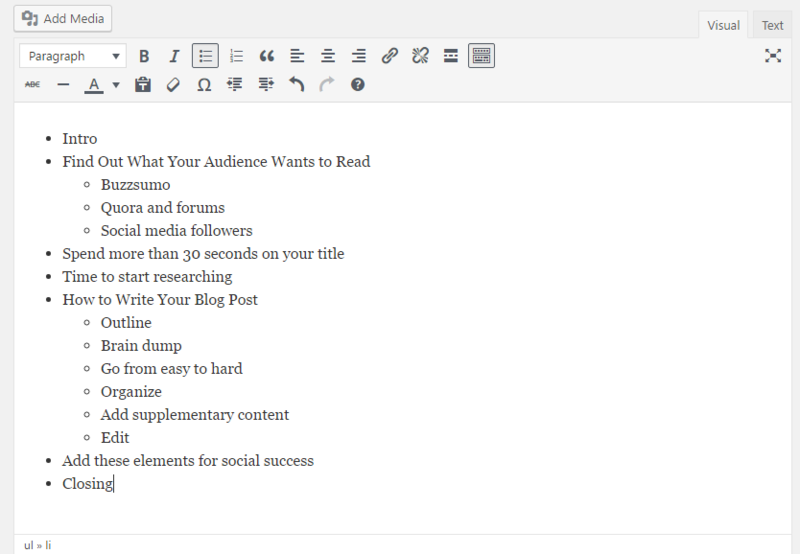 If you have a lot of great ideas for your blog post, but can’t seem to organize them, then your best bet might be to just get them out on paper or in a Word doc first. You can worry about the organization and editing afterward. This will ensure that you are not inhibited to the point that you get stuck trying to write your blog post. Looking at a blank piece of paper or Word document can be extremely discouraging when writing a blog post. If you find yourself with an outline, but not able to write the introduction or first section, feel free to skip around. Often times the intro is the most difficult part to come up with. Start with the sections you feel will be easiest to write first, and then go back to the tougher parts later. The more you complete, the more encouraged you will be to finish up the rest. Writing for the web is significantly different than any other format. Aside from the way text looks on a computer versus print, there’s also the fact that you’re competing with millions of other articles for your reader’s attention. Then writing with the intent of people finding and sharing your content on social media adds another dimension. 55% of all page views get less than 15 seconds of attention. The average visitor only reads about 20% of the text on a page. 2-3 letter words get looked over almost 75% of the time. Visitors only spend 20% of their attention on content below the fold. It takes people 20-30% longer to read online than it does to read on paper. In order to appeal to skimmers, write in shorter paragraphs, use bullet/numbered lists and subheadings. Your articles should look more like the example on the right than the left. If you didn’t already, go back through your organized content and add images, video, statistics, case studies and other data or resource links to applicable sections. The more you can backup your content, the more trustworthy it will be for readers. One study found that 58% of consumers trust editorial content, so convince the other 42% to trust yours with some detailed research. Always link to any sources of data you mention. Once your blog post is organized, and supplementary content has been added in, it’s time to edit your content. If you have a content editor to forward your blog post to, that’s great. 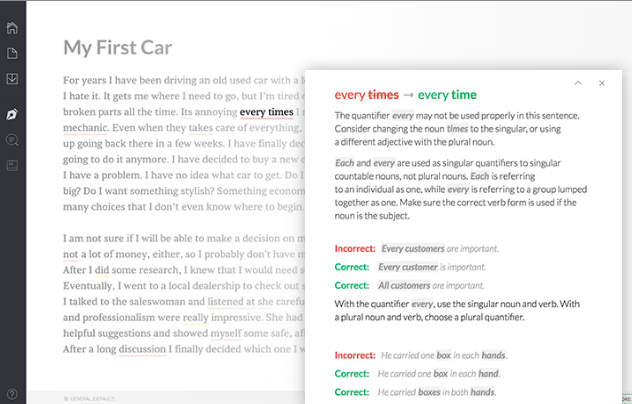 If you don’t, you can use tools like Grammarly to get the spelling and grammatical errors that Microsoft Word, Google Docs and other word processing tools miss. We highly suggest saving editing for last. As tempting as it may be to edit as you go along, it will only slow you down. Alright, now that your article is written, let’s make sure it’s optimized to be shared on social media. Add these elements to your blog post to attract social shares. The easiest way to ensure that all of your blog posts get shared on social media is to add social sharing buttons to your blog template. These buttons should appear on each and every blog post page, preferably at the top of the post before the content begins (like you see on this blog post) and at the bottom of the post as soon as the content ends. Why place it in both spots? At the top of the post, it encourages people to read the post, as they will assume a popular post must be good. At the bottom of the post, it encourages people who just finished reading the post to share it. Most major blogging platforms support social sharing buttons. AddThis, ShareThis, and Shareaholic are a few major social sharing button providers that will work with most of the top blogging platforms. 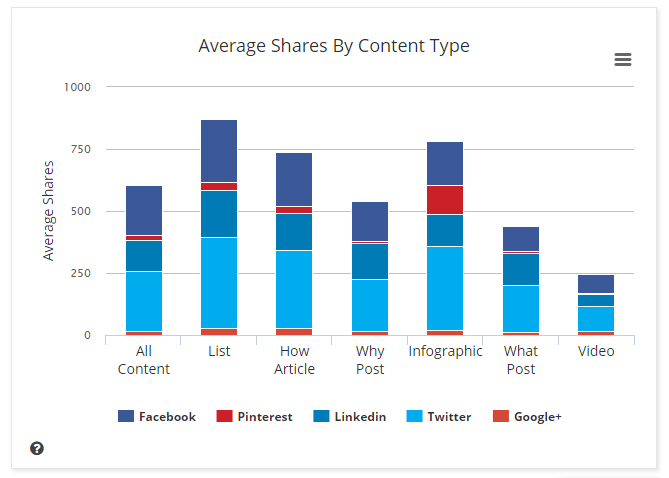 They will also provide you some great analytics to learn more about your most-shared content. Whether it’s statistics, witty lines or quotes, having lines that are short enough to Tweet (shoot for under 100 characters) will encourage people to share them. You may have seen this cool little feature on sites like Hubspot or even in some of our posts. You can use free tools like Click to Tweet to turn text from your blog posts into Tweets. Plus, you can automatically add your Twitter Handle in the Tweet to earn some extra followers. What if you could bait users with large followings into sharing and promoting your content on social media? And without having to send cold emails or pay them for advertising. All you have to do is mention them within your article. Then send a Tweet and @Mention them. People love to see that they’ve been mentioned or highlighted in an article. Naturally they’ll want to show it off by Retweeting or replying to your Tweet. You can start by identifying influencers you’d like to get a mention from. Look for ways you can incorporate them into your article, then Tweet about it. Additionally, you can also @Mention any sites where you used stats and data in your article. There you have it. Everything you need to know about how to write a blog post your audience can’t resist sharing. Writing a great blog post can take time, from coming up with great ideas to making sure your blog post is optimized to get the best results in search engines and social media. If you take the time to create high-quality content following this process, you will gain the traffic, engagement and results you want from your content.